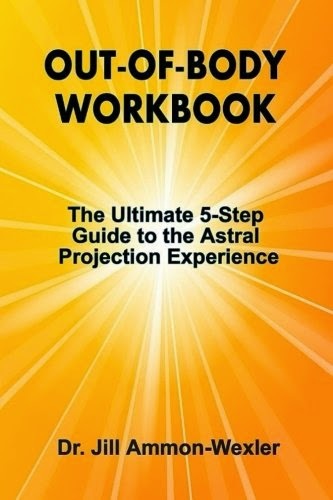 This time I'm reviewing the book Out-of-Body Workbook: The Ultimate 5-Step Guide to the Astral Projection Experience. This is not a big book. It's 124 pages in length, but the font is big and there's a lot of wasted space, so there's not a lot of information. It's a quick read. The author bills herself as "a pioneer mind/brain & consciousness researcher, doctor of psychology and metaphysician with an interest in higher mental states" so I expected high quality material. Unfortunately, it was disappointing. "Here's a true story to give you a glimpse of one type of OBE... Somehow the woman has been able to see Jack in her mind's eye, although common sense says this is impossible..."
That aptly describes remote viewing as far as I'm concerned, and yes, I've read a few books on the subject, taken RV classes and done RV myself. Maybe I'm just being stubborn with my definition of an OBE, but to me it seems pretty straightforward. All about OBEs. This is basic information and some preparation tips. It's good but basic. Planning Your Experience. This talks about hypnosis, hypnagogic entry, meditation entry, shamanic entry, and drugs (pharmacological entry). Selecting a method. This has some basic OBE techniques, mostly found in other books: (a) Buhlman's "Target" technique, (b) Muldoon's "Thirst as Subconscious Motivation" technique, (c) Glaskin's "Christos Technique"--outrageously misspelling his name!, (d) Bruce's "Rope" technique, (e) Monroe's "Lines of Force" technique (from Journeys Out of the Body). (f) She ends with her "Preferred Method" (explained below). OBE Skill Refinement. This covers basics of relaxation, visualization, and energy body awareness. Again, good information, but basic. Creating an OBE. This is where she talks about the actual separation process after the OBE has been induced: floating out, rolling out, visualizing a duplicate body, and so forth. She waits until she wakes up in the middle of the night (google WBTB: Wake Back To Bed). Then she begins "her" Energy Flow Visualization, although this is pretty much the "VELO" exercise developed by the IAC (think Luis Minero). Mental Focus. Basically she sets her intention with an OBE affirmation (as taught by Buhlman and others). She maintains Bodily Awareness, basically trying to stay aware while watching herself fall back to sleep. Record Keeping (writing down your OBEs and also keeping a dream journal to improve recall). As Dr. Eben Alexander explained in his book Proof of Heaven, just because your heart has stopped (cardiac arrest) does not mean your brain has shut down. Alexander is a brain expert, and his information seems accurate, from other books I've read. Interestingly, his NDE did occur when his brain was shut down completely, by E.Coli Bacterial meningitis. So it does happen, but it's not always the case. "To correct this "brainwave gap problem," I have created a special Schumann frequency brainwave training audio. People who have used it reported better dream recall, increased lucid dreaming, improved intuition, and more achievable OBE practices." The book had several typos and grammatical problems. For example, in many cases she refers to the OBE as an "OBE Experience" which I translate in my mind as "Out of Body Experience Experience." Her spelling was okay for the most part, but I doubt if she even used a simple spellchecker. On page 120, I found the word "then" misspelled as "yjrn." I expected more from a doctor of psychology. She's apparently the author of more than 30 books, so maybe she's just pumping them out too quickly. Is this the "Ultimate 5-Step Guide to the Astral Projection Experience" as the subtitle says? No. The bottom line is that this book gives some good basics, but doesn't go into enough depth on any subject. 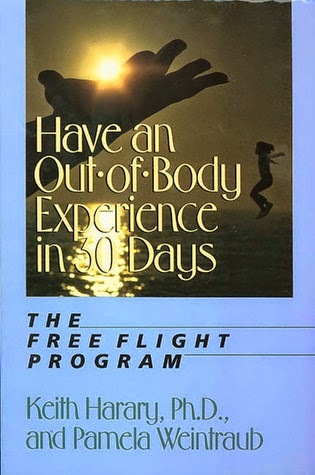 This time I'm reviewing Have an Out-of-Body Experience in 30 Days: The Free Flight Program by Keith Harary, Ph.D. and Pamela Weintraub. There are several books out there that promise to teach you how to self-induce OBEs in a fixed time frame. This is the first one I remember. It's copyrighted 1989, and I'm pretty sure that's when I bought it. So rewind to 1989. When I first got the book, the thing that excited me most was the authors: Keith Harary is actually famous in the field of OBEs and parapsychology. In the early 1970s, when he was still in college, he hooked up with the Psychical Research Foundation and did many OBE laboratory experiments at Duke University. He quickly became a star psychic. Using the name Stuart "Blue" Harary (before he changed it to Keith), his experiments tried to establish veridical proof of OBEs. In some of the experiments, he would travel in OBEs to another room where his cat (Spirit) was filmed. The scientists assessed his ability to remotely affect the cat by counting the number of meow sounds it made. And they got good results. The scientists noted that when Harary was visiting the cat in his out-of-body state, it became much more quiet, which seemed to indicate there actually was a real-world component to his OBEs. So I was excited when I first cracked open the book in 1989. Unfortunately, I quickly became bored with it and put it down. I tried several times to finish reading it, but always got bored, until it landed back on my bookshelf. Flash forward to 2014: I decided to try it again. After all, it's a short book; about 100 pages. This is Blue Harary; it's got to be good, right? After all, I loved Ingo Swann's OBE book, To Kiss Earth Goodbye, which has a similar history. This time I got through it, but man...I was still bored. It just didn't hold my interest. I kept finding excuses to put it down and do something else. So what is it with this book? It is entirely devoted to teaching the skills of inducing an OBE. That's okay. The problem is: that's all it is. It's just a bunch of instructions of what to do on each of the 30 days. There are no OBE narratives, no theories, no scientific examinations, and no discussions. There are a few suggested experiments, I guess. One problem is, most of the exercises are geared toward increasing the ability to visualize and the use of imagination. That's not a bad thing, but it felt like paragraph after paragraph of explaining how to accomplish "The Target Technique." The Target Technique, described in a few OBE books, is where you lie down, close your eyes, relax, and then try to visualize a place you are very familiar with, as vividly as possible. For example, visualize standing in your living room, or at the front door to your house, apartment or flat. Try to look around you and see all the details of that location, in your imagination. If necessary, visit that place physically a few times to ingrain it into your memory, and try again. Buhlman describes it quite well, and gives easy instructions. Harary and Weintraub take it further by immersing you in different senses: taking baths, trying to imagine the past or future of a location; all kinds of variations. It's not a bad thing. It's just...tedious. I only "flagged" two things in the book that interested me. First, they recommended an affirmation, "I'll allow myself to have an out-of-body experience." I liked that for many reasons. Unlike many OBE affirmations, this one can cut through subconscious roadblocks. It seemed...innovative...because I think a lot of people have subconscious reservations about OBEs. Another innovative idea was an exercise in which you go to sleep at an unusual location, like a hotel, and when you awaken in the morning, you lie still and imagine you're at home in your own bed. That seemed like it was worth a try. Another interesting thing is that, with many of the exercises, they recommend imagining your own face looking back at you from above. I can't remember other books recommending that, so it struck me as interesting. The spelling and grammar were professional; I only recall one typo. This book is alright, but it's not high on my list. It might be good for someone who needs to work on their visualization skills. In my opinion, it just lacks flavor.